Part of the fun of wealth is giving it away! This is the perfect time to think about philanthropy — after all, it’s the season of giving and charitable giving often gives you a little bonus in the form of a year-end tax deduction. But maybe a more strategic giving plan would make better sense for you, your family and other designated heirs, as well as the charities you wish to support. Planned giving was the subject of a recent seminar on philanthropy hosted by Plan to Prosper, a financial planning firm.The seminar was moderated by Plan to Prosper’s Jane Braun, a certified financial planner. Currently serving as president of Coronado Historical Association and a board member of Rotary Club of Coronado, Braun is already investigating the steps to form a local foundation. 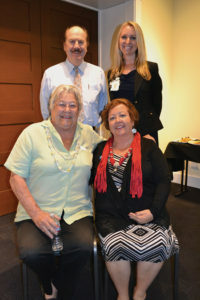 In the meantime, she invited local organizations to share their missions and financial needs, followed by a panel of financial professionals who discussed smart strategies in planned giving The organizations presenting were the Coronado Schools Foundation, Coronado Public Library, Coronado Historical Association and Coronado Hospital Foundation. Patty Cowan is in her fifteenth year as chief executive officer of Coronado Schools Foundation, which supports academics and technology in the classrooms of all Coronado public schools. The foundation funds such programs as science and computer labs in kindergarten to fifth grade and introduction to engineering, computer science and coding classes for middle and high school students. As a result, Coronado High School now has a compact with San Diego State University for engineering students. Esquevin noted that the library is supported by the city, which pays its bills, staff, and utilities. But the library began in 1890 as a private non-public-supported entity, an offshoot of the Presbyterian Church. Then Elisha Babcock, one of the first investors and the first manager of the Hotel del Coronado, and his wife became its first patrons. John D. Spreckels, after purchasing the Del, held many fundraisers at the hotel. “They even had the secretary of the Del arrange for its guests to support the library,” Esquevin noted. Spreckels and Babcock made a rent-free arrangement for the old pavilion (now the site of the Glorietta Bay Inn) to become the Coronado Beach Library from 1895 through 1909. In 1909, Spreckels paid for the land, design by his architect Harrison Albright and the construction of the first library at its current location in the 600 block of Orange Avenue. “But from then on, the city of Coronado paid the library’s basic functions; donors who left bequests have been a big level of support,” Esquevin said. One example of a major donation that Esquevin cited was from the estate of Judith Bond, who worked as one of the archivists at the Hotel Del. It allowed for digitizing all the Coronado newspapers from 1887 to 2012. Patrons can now access the fully indexed papers from their home or office via the Internet. “You can see the full pages, just as they were,” Esquevin said. Susan Keith, a board member of Coronado Historical Association, said that this Coronado nonprofit lies closest to her heart — and not just because her mother, Eleanor Ring Storrs, signed the association’s articles of incorporation in 1969. Philanthropy makes the work of the association possible, Keith said. As one example, Don and Leslie Budinger are gifting the building where the association is located, the former Bank of Commerce, to the historical group over a number of years. “We house our archives in the vaults of the former bank that stood on this corner. The archives are well protected, and we can control the humidity and temperature,” Keith said. Among the association’s archives are approximately 20,000 photographs; 20,000 documents and about 3,000 objects, referred to as “3Ds.” “One of the problems with 3Ds is you cannot pile them on top of each other. We need to purchase more archival boxes and they are expensive,” Keith said. The association research library is available to the public free of charge, with nominal charges for copies. “John D. Spreckels donated land in 1938 for the hospital at its current location on Soledad Place. In the late 1960s, as the city’s population grew, the hospital board decided they needed to expand and built the present four-story building. They were a bit short of funds until a hospital volunteer requested a family member donate $2.3 million in Coca-Cola stock. That gift allowed the hospital to open its new doors, debt free. That volunteer also started the hospital’s Meals on Wheels program and when she passed in 2010, she left us a wonderful estate gift. And, yes, it was Frances Harpst; her daughter continues to volunteer with us and give back to this community,” Boswell said. Boswell noted that Sharp Coronado was the first hospital in San Diego County to do partial joint replacements using robotic surgery and that it continues to focus on the needs of the community. The $12.5 million Payne Family Outpatient Pavilion, which will open in summer 2018, was funded by hundreds of community members including leaders such as Bob and Patty Payne, with two-to-one matching funds by the city of Coronado. The panel of estate-planning strategists included Norm Timmons, who began Sharp Healthcare Foundation’s planned giving programs and four Coronado residents well-versed in planning giving: Michael Manning of Manning Wealth Management, estate planning attorneys Margaret “Tami” Sandke and Pat Callahan, and Dan Gensler, founder and president of the wealth management firm, The Gensler Group. 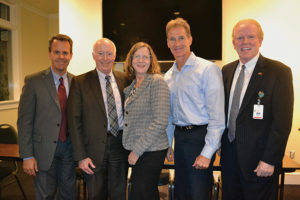 Plan to Prosper hosted a “giving” seminar that featured a panel of estate planning specialists including, from left, Dan Gensler, founder and president of the wealth management firm, The Gensler Group; attorney Pat Callahan of Callahan, Sullivan; attorney Margaret “Tami” Sandke; Michael Manning of Manning Wealth Management; and Norm Timmons, head of Sharp HealthCare Foundation’s planned giving programs. 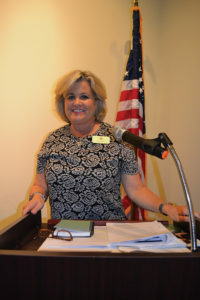 Jane Braun, CFP, of Plan to Prosper, hosted and moderated the seminar on planned giving. Clockwise from upper left: Christian Esquevin of the Coronado Public Library, Nora Boswell of Coronado Hospital Foundation, Patty Cowan of Coronado Schools Foundation and Susan Keith of Coronado Historical Association all work with organizations that benefit from philanthropic gifts.